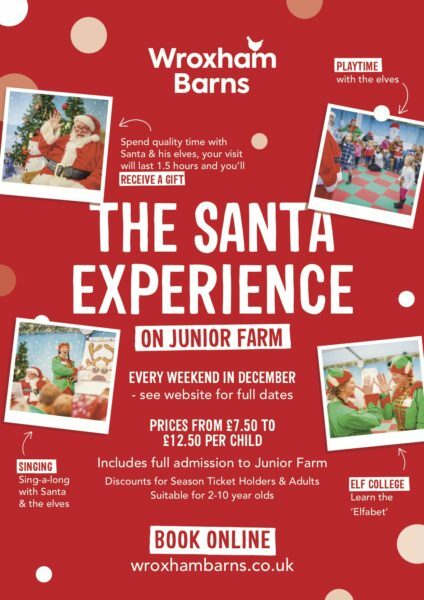 Christmas Fun with Santa on Junior Farm – possibly the best Santa Experience for little ones in Norfolk. Norfolk’s favourite Santa has agreed once again to take time out of his busy schedule at the North Pole and will be coming to Junior Farm at Wroxham Barns with his Elves for his hugely popular ‘Santa Experience’ where you can have Christmas Fun with Santa on Saturday 1st, Sunday 2nd, Saturday 8th, Sunday 9th, Saturday 15th, Sunday 16th, Wednesday 19th, Thursday 20th, Friday 21st, Saturday 22nd and Sunday 23rd December. There will be no need to rush as your visit lasts 1½ hours so there will be plenty of singing, games and the opportunity to spend quality time with Santa and his Elves. NEW this year is Elf College where the children take part in fun challenges – including learning the “Elfabet” – before each child receives a gift from Santa (the perfect photo opportunity for the grown-ups to get some fabulous images to keep and to share). Suitable for children aged 2 to 10 years. Buy tickets online at our website NOW, but be quick as this event sells out every year so be sure to get your tickets as places are limited for each event! Choose from 10.00am, 11.15am, 12.45pm, 2.15pm and 3.30pm. Prices range from £7.50 to £12.50 per child and in addition to the Santa Experience on Junior Farm also include full admission for the whole day to enjoy all the other activities and meet the friendly animals on Junior Farm. Discounts available for Season Ticket Holders and adults.